When we create new module under EasyIoT Cloud configuration (Configure->Modules->Add module), we declare module type. Module Type defines module presentation in Web interface or native mobile app. There are listed standard module types starting with MT_* prefix. Standard types are AI, AO, DI, DO dimmer and so on. If we want to represent new module type, we can create new module type, and then use it in module configuration. In this tutorial we will show how to create new module type for irrigation system. Our irrigation system has soil humidity sensor, settings for soil humidity threshold, auto/manual mode and pump motor. Soil humidity threshold will be represented in WEB interface as slider (AO - analog output), irrigation mode as switch (DO - digital output) and also pump motor will be represented as switch (DO - digital output). Soil humidity will be represented as value in WEB interface. To create new type go in Web interface to to Configure->Module types. The easiest way to create new module type is to copy existing module type and modify it. For our template we will select module type MT_DIMMER which uses AO and DO. 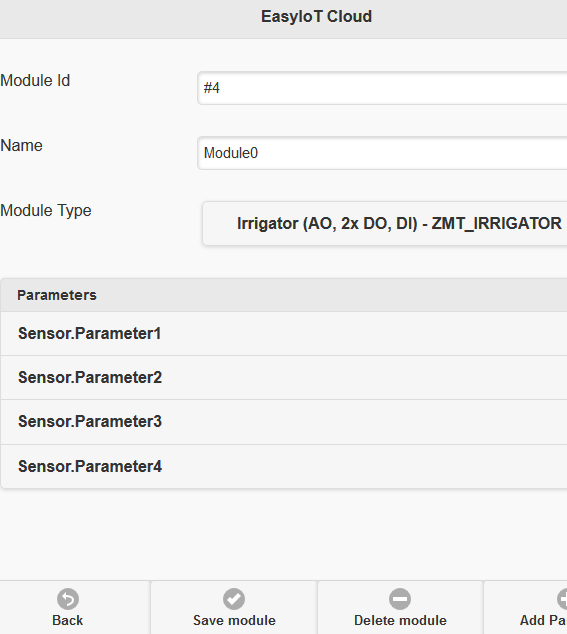 Next change name to ZMT_IRRIGATOR and description to Irrigator (AO, 2x DO, DI) and press button Create/update module type. Now you should see new module type. New module type is the same as MT_DIMMER. To change representation in WEB interface we change HTML code for module. This can be done in Module Type main HTML editor. Modified parts are under comments <!-- mode auto/manual --> and <!-- motor pump --> Basically we add two slide switches. If you done everything right, you can try new module type in new module. Add new module under Configure->Modules and press button Add module. Under new module set module type ZMT_ITRIGGATOR. 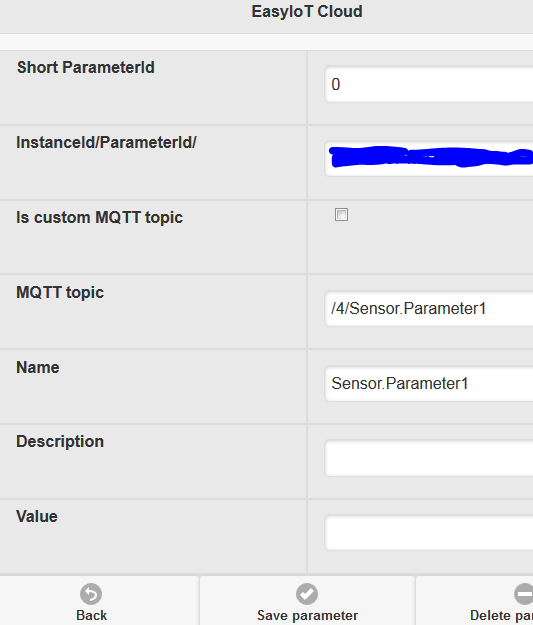 Also add additional parameters (Sensor.Parameter1, Sensor.Parameter2, Sensor.Parameter3, Sensor.Parameter4). Next add newly created module to one of groups under Configure->Module groups. Select one group and add module in group. In our case we added module under Default group. Go back on main page and you should see our module with slider and two switches. In our program we first modify initControl function. The most important modification here is to add event on flip switch to send motor pump state. Next we change getModuleData function. We modify part which display module status and motor pump switch. In updateControl we correctly update module status with data previously stored in getModuleData function. Values are changing dependent on values in sensor parameters or switch states. New module type is visible only in WEB interface. On native mobile application is visible as generic module. In next tutorial we will show how to build HW for irrigation system based on ESP8266 and ESP8266 Arduino IDE. I cant make everything visible. A good tutorial at least. Is there a module preconfigured for managing roller shutter? No, but you can build your own control for roller shutter.